Last Tuesday evening, I co-hosted the first Death Café in Chicago. A phenomenon that began in Switzerland and spread to London, a Death Café provides a safe, non-judgmental and non-therapeutic setting for people to come together and talk about death and grief. Our group was all men (except me, lurking on the edge). Although the seven men did talk about friends – and even animals – there happened to be an unusual situation: one man’s mother was actively dying. As befitting a supportive atmosphere, most of the conversations had to do with family dynamics and relationships. 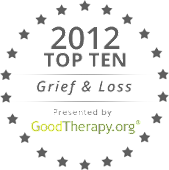 The feelings associated with grief are common, no matter the relationship to the person who died: sadness, guilt, anger, regret, gratitude. All of them were on display Tuesday as these men came together for two hours. The one emotion that may have surprised them all was relief. As I’ve written before, men are frequently locked into a cultural stereotype after the death of a friend or family member. They’re expected to be the ‘strong, silent type’. They’re looked to by others as leaders, in control of their emotions. More than one tear was shed, and more than one man was surprised by how much he felt comfortable sharing, even with strangers. As it turned out, the timing was a blessing: the one man’s mother died very early Thursday morning. We all – co-hosts and participants – learned a lot. Plans are already being made for a second Death Café, this one for men and women. It’ll be interesting to see if and how that changes the dynamic. One thing’s for sure: this is a conversation that will continue.